A colleague and good friend submitted her resignation earlier this week. The two of us have been talking about a big project, and we had a working lunch scheduled anyway, but with her departure we decided we needed to make it more of an event. “Suburban?” I suggested. “SUBURBAN!” she wrote back. 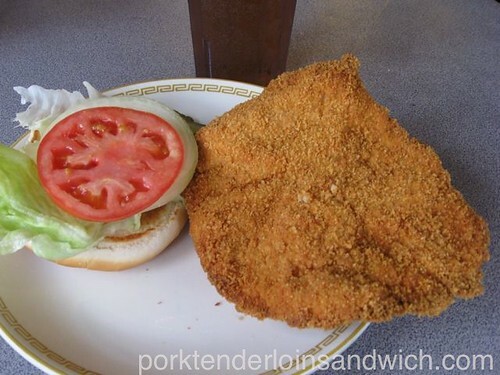 Now, you would get an argument about the best pork tenderloin in Iowa, but ‘around these parts’ there’s only one contender: the Suburban Restaurant in Gilbert. The place would be worth it just for the directions–drive 2 miles north of town, turn left at the Casey’s gas station, then left again at the pumps, park, and see if the two sisters who run the place have decided to open for lunch or not. We were early, but they still served us piping hot tenderloins and sides “Oh,” my colleague said when I ordered cole slaw, “of course you’d get the healthy option.” They were, of course, perfect. A big bite of crust and juicy, but not greasy, meat inside. You know it’s good when you sort of mourn the end of the overhanging bits, and then decide the hell with the bun…Empty calories, anyway. I’ve decided that this will be a project. We’ve done enough fried chicken that the deep frying part doesn’t scare me anymore. But the pounding of meat will be a new thing for us, and I’m thinking a bit of rosemary in the breading might do the pork justice. The kids are skeptical–I’ve explained to them that it will be just like fried chicken, but with pork, and they’ve both suggested that we have mulligans ready. “Trust me,” I said. “It will be your favorite sandwich of all time. You’re Iowans! It’s your birthright!” Of course, they were both born in California, so it may not work like that. Anyway, watch this space. Leftovers tonight. This pizza dough does not survive the fridge as well as the artisanal stuff, that’s for sure. We’ll see how the gelato survived the night later on…Or, rather, the kids will, since my calorie counter has officially kicked me out of the kitchen for the rest of the night. Worth it, though. Nah, yellow mustard on them is pretty common (even though it is also disgusting). You would get odd looks if you put real mustard on them (even though it would be good.) I, sacreligiously, use the Iowa Red Salsa. And I agree with this being an Iowa trademark food. The other would be 1 1/2″ thick Iowa pork chops. Mmmmm. Cooked piggies. True that about the cheap yellow mustard. But I get odd looks at the Suburban anyway, really, even if you follow protocol. Maybe it’s the jacket and tie? You are currently reading local cuisine–pork tenderloins at Domestically Challenged.